Philadelphia, PA –This week, Department of Human Services (DHS) Secretary Teresa Miller joined managed care organizations at Metropolitan Area Neighborhood Nutrition Alliance (MANNA) to discuss the Food is Medicine movement, and innovative ways providers are partnering to provide access to high-quality health care and nutrition to the individuals they serve. DHS is placing greater emphasis on social determinants of health, like housing, food insecurity and employment. Because the department’s health care spending is driven by so much more than just the health care individuals receive, DHS is working closely with managed care organizations and encouraging them to find creative, innovative ways to help individuals address the social and environmental factors that impact their health. Diet-related chronic illness impacts more than 60 percent of Pennsylvania residents, and this accounts for more than 80 percent of health care costs. The innovative MANNA model of providing medically tailored meals to individuals with life-threatening illness has proven extremely successful, and this model has expanded into partnership with Managed Care organizations to focus on specific disease states. A peer-reviewed study in the Journal of Primary Care & Community Health showed that those who received MANNA meals saw a 31 percent reduction in average monthly health care costs, and 37 percent shorter hospital stays for those who were hospitalized versus a matched group. Over the coming months, the department will continue to meet with managed care organizations to discuss innovative ways they are providing health care to the individuals they serve and helping to combat social determinants of health. Recently, the department joined Health Partner Plans to announce their collaboration with Philadelphia FIGHT Community Health Centers and Broad Street Ministry in improving access to health care for individuals battling homelessness and chronic health conditions. 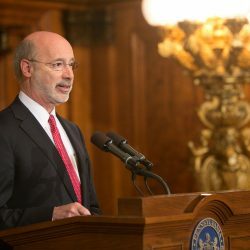 “Partnerships like these benefit everyone involved – from recipients, managed care organizations and community partners to the state budget – by improving access to care, health outcomes, and reducing costs,” said Miller. For more information on the work being done at DHS, visit www.dhs.pa.gov. For more information on MANNA, visit www.mannapa.org.